I'm currently at the hospital while writing this.. While I'm serving the community (cheewahh..) My husband will be at home taking care of our children. I'm really thankful because I can rely on him to take care of the girls while I'm away and not worry a thing about them. And my husband will send me pictures of them having fun at home.. Mostly just wanna make me feel jealous, I think! Hehe.. Yes it works! Yes I'm jealous! Tasha loves to crawl around the house. She can be found wandering around on her own, hiding behind the curtain, playing under the dining table, crawling from room to room.. This girl is really active. And for the past three weeks, she has started to stand and cruise.. the sofa is her favourite.. The picture above, that's Tasha under the dining table, trying to cruise while holding on to the seats, and check out B's expression.. priceless moment! Thank you S for making sure I didn't miss this moment! Posted on October 29, 2013 by Dr Halina Mohd YunosPosted in MommyhoodTagged doctor mommy, work. Previous Previous post: Dining Out..
Next Next post: Wonder Woman!! What a cute doc.. I’m really adored u … strong working mummy..hopefully I can be like u especially during my work time..
Doc, pasang cc camera Kat Umah and link to yr computer at work, so that u can check what they’re doing at home all the time. Now zaman Serbs canggih can do one. Bila time keje, hati memang meronta-ronta nak tengok anak-anak kan. Dah majan ke belum diorang, dah mandi ke belum… Hari-hari rindu. hehe. Cute la your kids dr especially Tasha tu…. bella mesti nk tgk tasha tu..tasha plk chill je duk bawah meja..hihi..sungguh cute dorang ni..
dimana Dr beli botol air Bella tu ya. Please share..mencari yang satu seperti itu juga..
lbh kureng je mcm saya. penjaga ank which is my sis always send pics. sometimes we had video call. mslhnya bila si ank nmpk si mami dlm video mula la nk dtg kat mami. nk masuk dlm vdeo hihiks! daaah mami pn ssh nk wat keje jd rindu. Bertuah Dr boleh suruh hubby look after the kids. 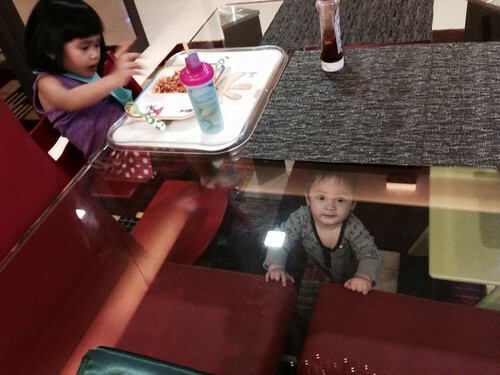 Comellah Tasha dok berdiri kat bawah dining table tu…. so sweet tengok anak2 DR nie…kalau boleh every moment tue tak nak miss…satisfied bila dapat tgk anak2 membesar depan mata.